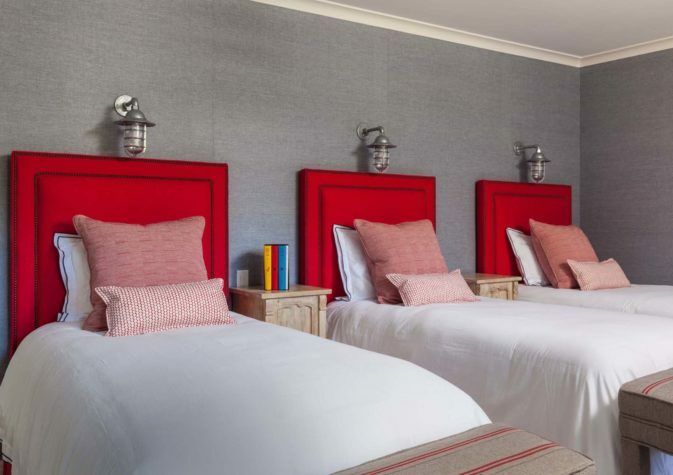 Lead designer Bronwyn Huffard transformed one of the home’s three upstairs bedrooms into a sophisticated bunk room with gray flannel walls and a nautically inspired companion way light over each linen-upholstered headboard. Galvanized barn lights, gooseneck faucets, and a wall-mounted industrial sink from Kohler bring farmhouse spirit to the triple bunk’s adjoining bath. A four-foot band of Kerrie Kelly marble tiles inlaid with blue glass adds a subtle note of luxury to the shower walls. Easy accessibility and free flow of light were key architectural goals. Kitchen designer Jeanne Rapone consulted with the design team to create the high-functioning open kitchen. Six rush-seat swivel chairs pull up to the island, topped in honed Jet Mist granite. 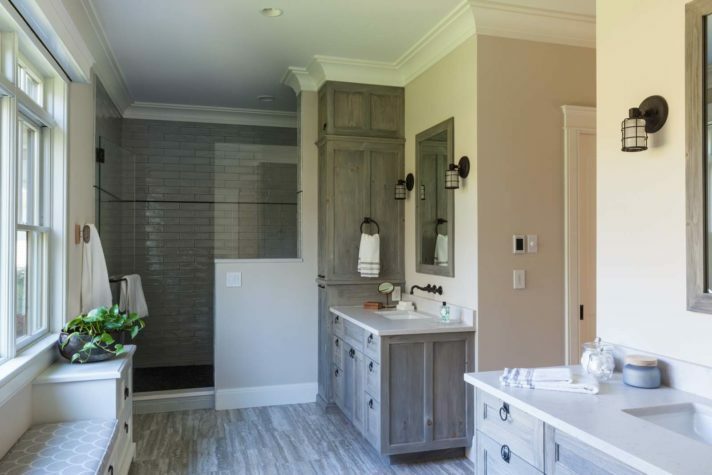 The first-floor owners’ suite includes a three-season porch and adjoining bath with walk-in shower and his-and-hers vanities and dressing rooms. In a nod to ninetheenth-century farmhouse style, a standing-seam metal roof covers the main house’s front entry porch, and a rooster-vaned cupola tops the connected three-bay garage (with a second-floor finished room). A circular window defines the wing devoted to the vaulted owners’ suite. 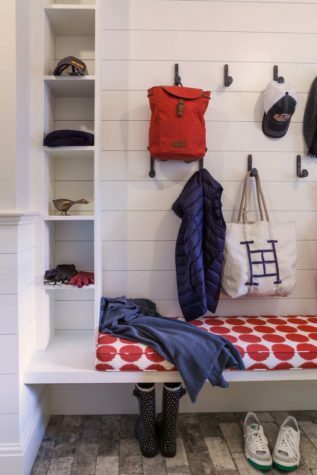 Faux bois ceramic floor tiles and nickel-gap plank walls keep the mudroom looking fresh. Farrow and Ball’s classic “Card Room Green” sets a serene mood in the first-floor guest room. DSO Creative Fabrications of Portland built the massive square metal-and-wood table that anchors the multipurpose living space. 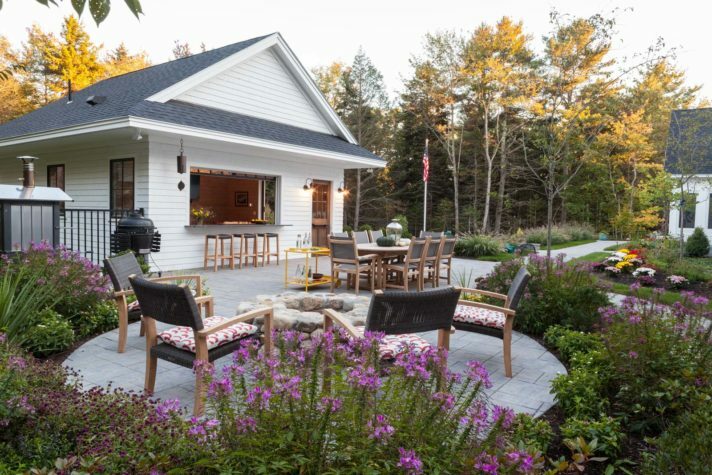 Cheerful gathering spaces—indoors and out—keep the homeowners connected to family and friends throughout the year. Antique beams, custom cabinetry, and an iron chandelier from Visual Comfort bring traditional formality to the dining room. Phillip Jeffries grasscloth adds color and texture to walls. Outside the freestanding pool cabana (aka “snack shack”), Kingsley Bate seating surrounds a stone fire pit that extends the outdoor season indefinitely. Much of the credit for the successful lateral move goes to lead designer Bronwyn Huffard, founder of the boutique design firm Huffard House in South Portland, and local contractor Russ Doucette of Russ Doucette Custom Home Builders in Scarborough. Over a period of two years, Huffard and Doucette worked together to help the owners prioritize their needs, formulate design strategies, and draw up architectural plans for a retirement residence that would fit comfortably into their active, family-focused lives for many years to come. As a close friend of the family, Huffard had a head start on understanding the couple’s warm, family-and-friends-centered approach to life. “Their daughter who lives nearby is a dear friend of mine,” the designer explains, “and when they decided it was time to downsize and simplify their lives, they invited me to be involved in planning what that might look like.” Huffard already knew the couple well socially and had a clear sense of the formalities they were eager to shed as well as the traditions they were committed to continuing. The major nonnegotiable item was location. There would be no discussion of leaving Maine,the couple’s home for 20 years. “Our friends, one of our daughters, and three of our eight grandchildren live in the local area, and we wanted to stay close,” says the wife. She invited Huffard to help her search Scarborough and Cape Elizabeth for an existing house to renovate, but they came away from that search empty- handed. “We wanted the lower level of our new home to be open, accessible, and easy to get around for all ages,” explains the wife. “But most of the houses on the market at the time we were looking were divided up into small, dark rooms with walls that could not be removed. We thought about renovating an existing home to add a master suite on the first floor, but most houses didn’t have enough land to allow for expansion.” It was Doucette, a respected general contractor with a deep understanding of the area’s zoning codes and a stellar team of subcontractors, who introduced the notion of ditching the renovation plan. “One day, after assessing a bunch of potential renovation projects for me, Russ said, ‘You know, you’d be better off designing and building a new house that will give you all the things you’re looking for,’” the wife recalls. It was a logical suggestion the couple had not considered. “Starting over from scratch at this point in our lives was not something we set out to do,” admits the wife. “But I gave the option some serious thought—and then gave my husband a couple of martinis the night I approached him with the idea.” After weighing the pros, cons, and final costs of renovation versus new construction, both husband and wife became convinced that designing a new house that would respond to their needs made more sense than engaging in a never-ending search for the perfect existing home or embarking on seemingly perpetual renovations and/or heavy-duty maintenance projects. So it came to pass that this happily retired couple surprised even themselves by bidding full asking price to acquire one of the last remaining vacant building lots in a post-2000 development of suburban homes in Cape Elizabeth’s Cross River neighborhood. 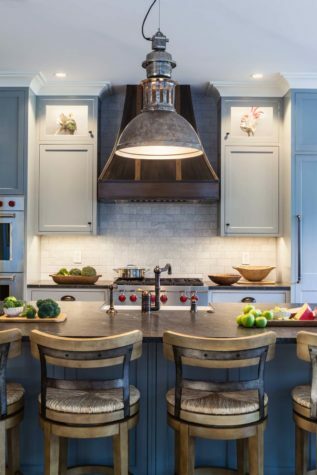 Then they shifted their focus to designing and building a new five-bedroom, seven-bath home that would keep them closely connected to the family, friends, and community they love. 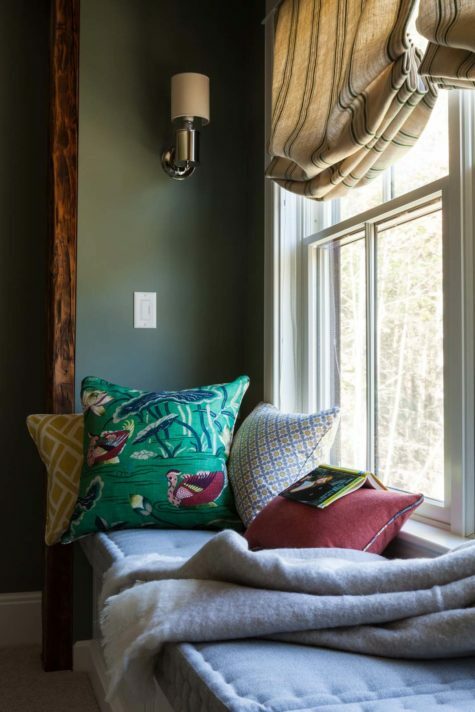 Topping the couple’s list of design “must haves” were a first-floor owners’ bedroom suite and a first-floor guest suite, “in recognition of the fact that we’re getting older—and so are our friends,” the wife says. Next requirement: an upstairs playroom for their eight grandchildren and en suite bedrooms designed to encourage frequent sleepovers. For a couple who likes to entertain, a high-functioning kitchen equipped with a six-burner Wolf rangetop, double oven, and the largest Sub-Zero refrigerator was essential. An adjoining butler’s pantry, accessible through a pocket door, contains a smaller prep sink, a full-size freezer, and storage for glassware, linens, and pantry items. Yes, serious cooking happens here. “My husband and I wanted the family dining area and living space to be open to the kitchen, so we could keep an eye on the children playing in the next room,” the wife explains. She worked with Huffard and Doucette to design a bright, multitasking living space that functions as a playroom, everyday dining area, and all around hang out space, with a TV, a gas fireplace (“no ‘real’ fireplace, because my husband doesn’t want to deal with hauling wood anymore,” the wife explains), and year-round views of the backyard pool and gardens, which were meticulously designed and installed by Anderson Landscape of North Yarmouth. 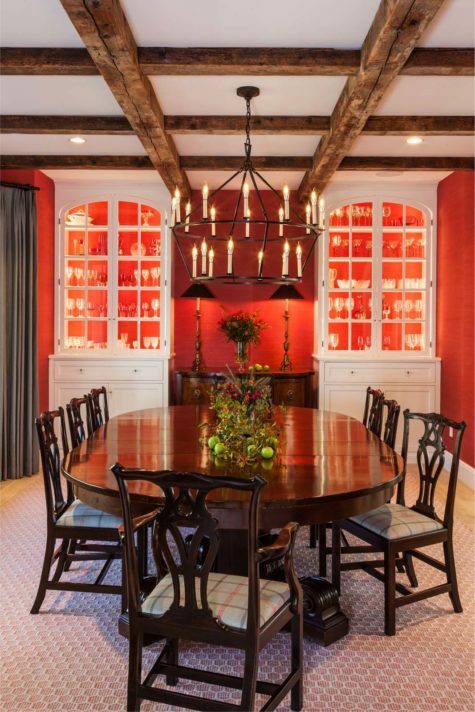 In a gracious bow to family tradition, the owners specified the creation of a distinct dining room. “It had to be large enough to accommodate their existing dining table,” says Huffard, “which was one of the few pieces of furniture they wanted to bring along with them from their former home.” When they install all seven leaves, that treasured heirloom—a circa-1860 Empire-style mahogany pedestal table acquired from the Ford estate—extends to comfortably seat 20 people. 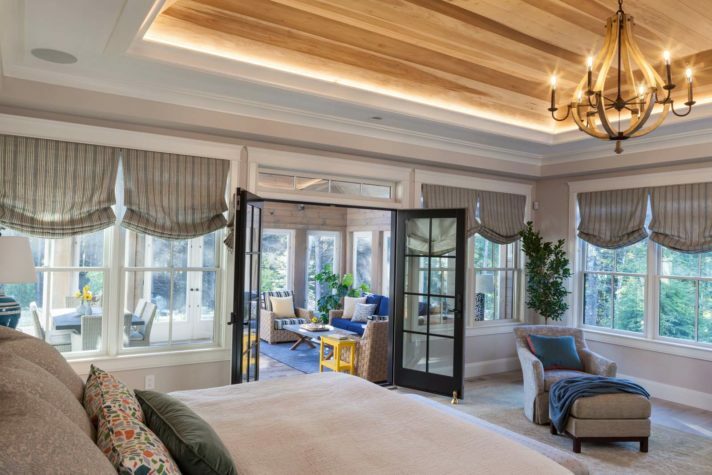 Doucette and his team fabricated the room’s backlit built-in cabinets and installed the antique ceiling beams that introduce the timeless warmth of wood to the newly constructed interior. For more casual gatherings and everyday summer meals, the owners wanted easygoing spaces where guests could gather for cookouts, pizza nights, lobster boils, and after-swim cocktails—a desire that led to the inclusion of the property’s detached 800-square-foot pool house and FROG (Finished Room Over Garage), a comfortable play space for all ages. Completed in 2017, the white-shingled dwelling’s structural footprint integrates a cupola-topped three-stall garage with carriage doors, a two-story main dwelling, and an adjoining owners’ bedroom wing with its own three-season screened porch. Nearby, the unheated pool cabana with slide-down window over the “snack bar” houses a seasonal kitchen, living room, and play space. The form’s historical roots can be found in the vernacular of New England’s “connected farmhouses,” which linked “big house,” cookhouse, and barn buildings for livestock and storage. In the seventeenth, eighteenth, and nineteenth centuries, the region’s linked farm buildings protected their inhabitants from the threats of extreme heat, cold, and invaders. Adapted by Huffard and Doucette for a new generation—with state-of-the-art HVAC systems, wireless technology, and low-maintenance building materials such as factory-stained cedar shingles and weather-resistant vinyl-clad Andersen windows—the farmstead-inspired form continues to perform its main duties honorably, keeping one Maine family warm, comfortable, safe, and forever closely connected.